When I Was on Fire. For Jesus. *I’m taking a quick break from my Common Core series to join up with Addie Zierman’s synchroblog today! I am fairly new to writer Addie Zierman. But we could be soul sisters. Seriously. Addie is the author of a just-realeased (as in TODAY!) 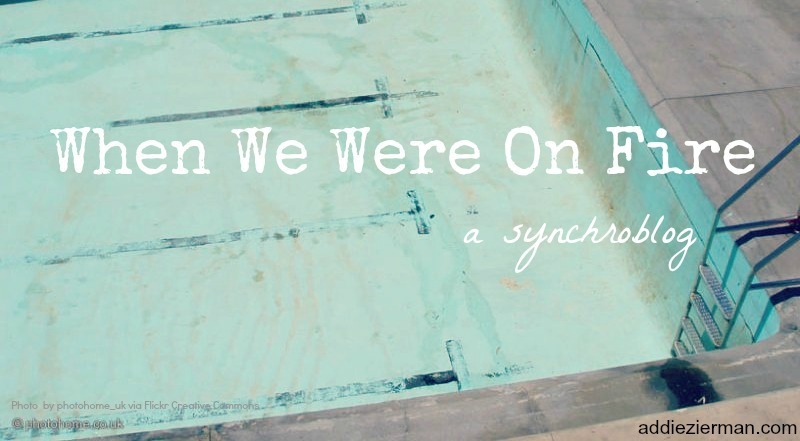 book called When We Were On Fire: A Memoir of Consuming Faith, Tangled Love, and Starting Over. My congratulations to you, Addie! You can read the Prologue and first chapter of her book here. Believe me. You’ll want to read it. Especially if, like me, you grew up in the 80s and 90s in the heat of “on fire” evangelicalism. Just listen to these words! That. Was. Me. Like Addie, I knew all the Christian lingo, owned all the Christian cassettes, and wore my True Love Waits and Go Against the Flow t-shirts with pride. I could quote dozens of Bible verses and sing the lyrics to every Amy Grant song. I knew every Old Testament Bible hero and could give you reason after reason for saving yourself for marriage. My parents had chosen to cross the world to proclaim our faith to Buddhists in Thailand. I was set to follow down their path and be a missionary, myself. I was on fire for Jesus. When I was seventeen, I flew from Bangkok to the States on my own to attend Nazarene Youth Congress, or NYC, a quadrennial Nazarene event for high schoolers. We convened in Phoenix, Arizona, and met at the arena where the Phoenix Suns played. One night they dimmed the house lights and assigned each section of seats a “role.” Every section represented a portion of the world’s population. Suddenly the section on the floor, which represented NYC-ers, was lit up with glow sticks. All the kids in that section moved up into the arena, passing out glow sticks to each person. As the room slowly began to light up with orange, green, and yellow lights, the speaker said, “I hope that you will go home and make an impact on your communities. I hope that you will go and shine and change the world. Will you shine for Jesus?” Then the Newsboys’ song “Shine” blasted over the speakers. I was seventeen years old, and I was in an arena full of 6500 teens who were all shining for Jesus. I was yelling and jumping on my seat and wildly waving my glow stick. The mania and adrenaline of that moment is unforgettable. Once again, I was ready to be a missionary, ready to go anywhere, do anything, to tell the world about Jesus. I was so hyped up about evangelizing the world with the light of Jesus that when we got back to the hotel that night, I stopped and gave my glow stick to the bus driver. I thanked her for her service to us and told her that Jesus loved her. Some of the kids on the bus were annoyed that they had to wait to get off the bus because of my evangelism, but I didn’t care. That glow stick was my heart that night, and I wanted God to take my heart and throw it into the world to shine for Him. As you know, a time came when that fire wavered. Faith became something more complex, confusing, and challenging. At some point, my mountaintop Christianity had to figure out how to make it in the valleys. I think Addie experience some of that too, and I can’t wait to read about her journey (hopefully her book will arrive tomorrow!). Though I sometimes critique the religious culture I came from, I also think it’s important to look back on those times and find the good in them. Sometimes I need to be reminded of that all-consuming fire. Were you ever on fire for Jesus? Join the synchroblog here. Common Core Standards, Part 2: What Do the Teachers Think? Love this hopeful, fond memory. I’m a sucker for stuff like that. 😉 And I love your sweet heart of love that stopped and gave yours to that bus driver. Thanks so much for sharing this and for linking up Karissa! Love this fond, hopeful memory. And the glowstick moment — I’m a sucker for stuff like that. How you can you not love that girl who, filled with love and passion, gave her glow-stick to the bus driver? Thanks so much for linking up Karissa and sharing your story. Thank you, Addie! Loved your book. Sorry your comments initially got stuck in spam!